This recipe for roast turkey is simple to make and very delicious. The glaze—consisting of balsamic vinegar, orange juice, thyme, and honey—is gorgeous on the bird and adds a wonderful flavor. The turkey can be stuffed with any stuffing you'd like. Make sure the turkey is completely thawed before you start this recipe. 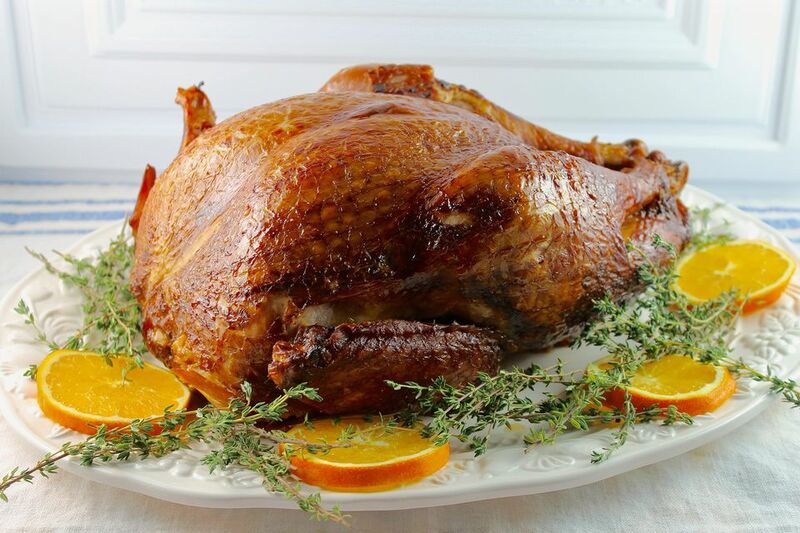 If you purchased a frozen turkey, thaw it in the refrigerator for at least 3 days. You can thaw a turkey in cold water; change the water every 30 minutes so it stays cold. Pat the turkey dry and place in a roasting pan. Bend the wings and tuck them under the turkey for a neat appearance. Preheat the oven to 350 F. Rub the turkey with the butter and sprinkle with salt and pepper. Put the orange segments and thyme sprigs in the turkey cavity. Set the bird aside. In a small saucepan, cook the vinegar over medium-high heat until it is reduced to about half. Stir in the honey, orange juice, dried thyme, and butter and simmer for 5 minutes. Remove from heat. Brush the turkey with some of the glaze and place in the oven. Roast according to cooking charts for unstuffed or stuffed turkey (depending on what you're doing), brushing with the glaze every 15 minutes for the first hour or until the glaze is used up. Continue roasting, basting with the juices in the pan every hour, until a meat thermometer inserted into the turkey thigh (make sure you are not touching the bone) registers 165 F.
Remove the turkey from the oven, cover it with foil, and let stand while you make finish cooking the rest of your Thanksgiving feast.